Light Efficient Design UK introduces its high output LED retrofit high-bays. Light Efficient Design LED retrofit high-bays are ideally suited for many applications including large retail, warehouse and industrial spaces, as well as leisure environments such as auditoria and gymnasiums. The LED 8032, for example, simply replaces up to 400W HIDs with only 140W of LED lighting. 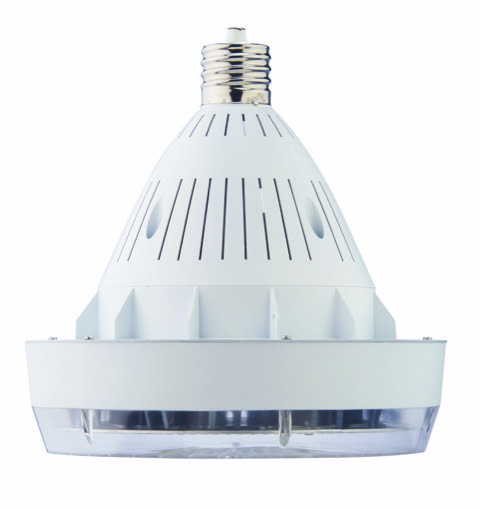 The conical, directional design means that all the light output is directed straight down and retrofits into existing high bay HID fittings with metal reflectors. Available in 4,000K and 5,700K CCT, all the LEDs are on the base of the lamp, ensuring a very high light output ratio. With a 50,000-hour-rated lamp life, all Light Efficient Design products are backed by a five-year warranty, are CE/ROHS certified and are approved for use in enclosed fittings, unlike most other LED retrofit lamps on the market today. The Light Efficient Design Newbury warehouse offers prompt delivery to UK and Irish electrical wholesalers on all Light Efficient Design retrofit LED products.